Griid's blatantly a one-trick pony, and it's not the cheapest. But it does do that trick very well. Focuses on just doing one thing, and does it very well. Excellent installation for otherwise tricky WiFi configuration. Nice overview of all clips in your set, and fast zoom in to chosen area. A mixer screen tucked away somewhere would be a nice addition. Griid is one of many music controller apps for Apple's iOS devices, existing to control applications on our 'proper' computers (this review is about Griid Pro, the iPad version). 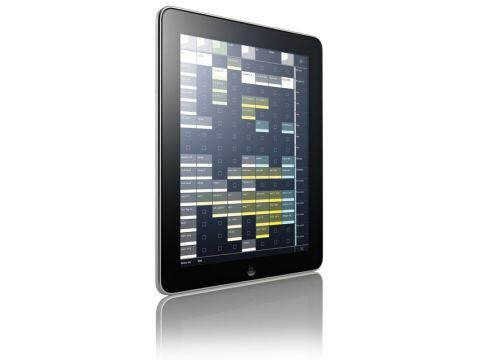 Griid is designed to work exclusively with Ableton Live, and it has pedigree: a couple of former JazzMutants bring their touchscreen experience, and there's also some guy called Richie Hawtin on board, who knows a thing or two about the needs of performers. Two things hit you about Griid immediately - the single-function design, and the price. £14.99 is expensive for an app, though cautious shoppers can download the free Griid Lite first, which is limited to a clip grid of 3x6 portrait, and 4x4 landscape (Griid Pro goes up to 8x16, or 11x11). Griid needs a WiFi network to talk to your computer, and the Griid Connector 'server' application, which is a free download from liine.net. These WiFi setups can be naughty, but trust the excellent Griid Setup Guide, and you should get it working first time. Griid has that sparse, techy look that geeks love - clip and scene names and colours are shown, yeah, but it's all very tasteful. You can navigate bigger sets by dragging left or right in the track headers, and up or down in the scene names - Liine discovered that making the clip area do double-duty for swiping and launching can cause latency. As well as using scenes, if you want to launch several clips at once, you can simply swipe sideways across them. A tap on the bottom right button zooms out to show all of the clips in your set, and another tap will zoom in at a new location. The top right button deals with track stop functions. Multi-touch clip launching is awesome fun, and there's no hardware equivalent that'll show clip names while you do it! A small iPad battery level indicator at the bottom of the screen is a nice touch for performance situations. Griid is a clip-launching app, pure and simple (though we must admit we'd still like a mixer page tucked away somewhere). Once you put it alongside a suitable hardware controller, everything falls into place. Hawtin is very hands-on with Griid, especially in his Plastikman guise, so it'll be interesting to see how his experience of using it live will feed back into app updates - we know there are other Griid modules coming, so let's see what they do next. Griid's of limited use in the studio or live situations where you don't have any physical controllers with you - the Liine guys confirm that this was a deliberate decision, believing that serious performers will want to use the best possible tool for each task. Griid is totally recommended for DJs and performers who want to add multi-touch clip launching to their live hardware setups, but it is an addition, not a solution.